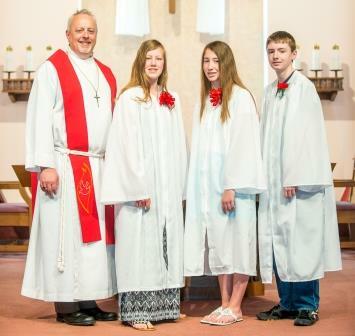 Confirmation has a long and valuable history within Christianity and the Lutheran tradition. Directly tied to the blessings received in Baptism, Junior Confirmation instruction provides an in-depth study of Biblical doctrines to provide the student not only with a deeper understanding of his or her faith, but the tools necessary to defend their beliefs and share their faith. The primary textbooks for our Junior Confirmation instruction are the Holy Bible and Luther’s Small Catechism. Confirmation classes for the 2016-2017 school year began with a student and parent meeting on Sunday, September 13, 2016. Youth entering the seventh grade and older are eligible to enroll in this two year course of study. For more information, please call Pastor Frusti at the church office (658-3000) or via e-mail.